Some of this material arrived well after the ballots from this house had been filled out and mailed. Two problems with our prolonged election period in Oregon are that it adds to the cost of campaigns and that much of the money spent is wasted. Wasted how? By paying for campaign propaganda that has absolutely no chance of working because it arrives after ballots have been cast. As of Sunday, the state reports that 341,000 or 16 percent of Oregon’s 2.2 million voters had cast their ballots. The state’s count is always a day or two behind, so the number and the percentage were actually a little higher, and by today they are higher still. In Linn County the turnout had already passed 20 percent, even though traditionally slow Benton County was only at 10 percent. In Senate District 8, where the Democrats desperately hope to gain firmer control of the Senate by replacing Republican Sen. Betsy Close of Albany with Democrat Sara Gelser of Corvallis, total campaign spending on behalf of both sides had already topped $1.1 million in cash and in-kind expenditures. And Gelser still had $132,000 in cold cash on hand. Close, well behind her rival in the money department throughout the campaign, was close to scraping the bottom of the barrel with just under $18,000 left. The facts of voting by mail from mid-October through Nov. 4 mean that campaigns have to start their heavy spending early and keep it up for almost three weeks. 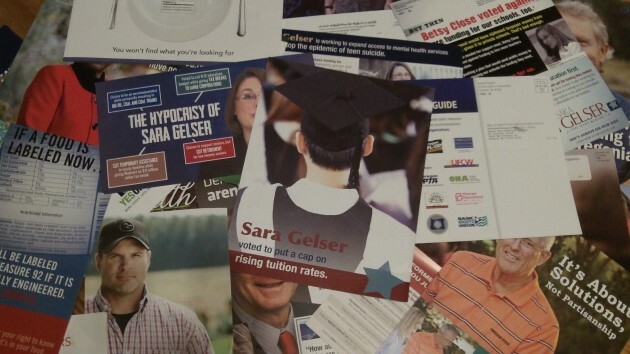 To take just two examples, as of Monday, Close had paid a Salem company $141,000 to arrange for broadcast advertising, and Gelser had sent $14,500 to Washington, D.C., to pay for surveys and polling. I don’t know how much of the overall campaign spending has been wasted on voters who can no longer be persuaded. But I’m sure a good chunk of it has. Like many other voters, we voted a couple of days after the ballots arrived. The elections website says my ballot was received on Oct. 22, almost two weeks before election day. And yet the campaign literature keeps pouring in. This stuff can’t be cheap — four-color printing on heavy stock, and then the postage! Last year the Mayor’s opposition PAC spent nearly $4,600 on bulk mailings to defeat the local debt and urban renewal measures. Clearly this was a waste given both measures passed with significant majorities. When the election results were announced she blamed the loss on a late mailing, of all things. Like you said, this stuff isn’t persuasive. But mailings can evidently provide a convenient way to explain a failed campaign. There is value in that, no?